Douglas-fir is a coniferous evergreen tree with several different varieties. 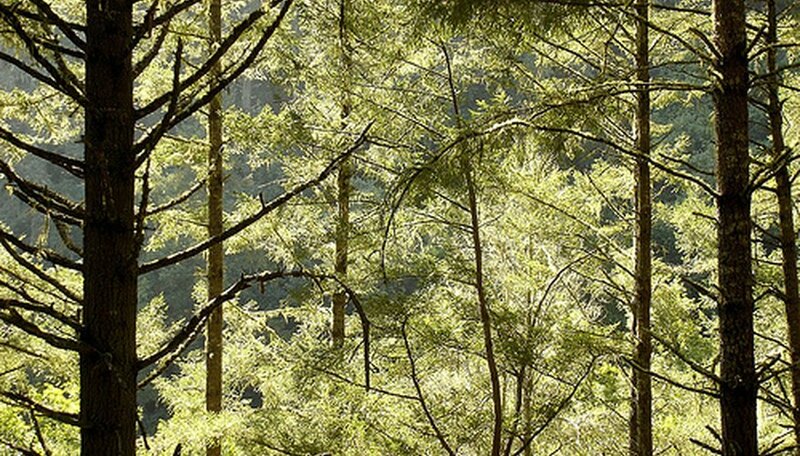 These varieties include the Coast Douglas-fir, the Rocky Mountain Douglas-fir, the Mexican Douglas-fir, and the Bigcone Douglas-fir. If you have a Douglas-fir in your yard or garden, pruning it is not absolutely necessary unless the tree seems unhealthy or contains many dead branches. Prune when you first plant the tree or in late winter if you are pruning an established Douglas-fir. It's fine to prune during a frost, as long as new spring growth has not yet started. The tree will be dormant during this time of year. Wear gardening gloves and a long-sleeved shirt, if possible. The needles of Douglas-fir trees can be sharp and prick your arms while pruning. Remove crisscrossing branches and dead branches to improve the health of the tree. Branches that are placed close together, are broken or dying or are crisscrossed should be trimmed right at the base of the branch after the slight swelling at the base of the branch, called the branch collar. If you leave a nub on the end of the branch when trimming, the branch will not fuse back to the trunk as easily and may cause decay. To avoid this, prune the branch off just after the slight swelling of the branch collar. Don't over prune. Heavy pruning is not necessary for Douglas-fir trees, and only needs to be done once a year at the most. Trim away dead or crisscrossed branches that appear detrimental to the growth of the tree. If you're not sure whether to prune it, leave it alone. Remove all branch trimmings away from the base of the tree. Leaving the branches around the bottom of the tree will prevent water and nutrients from absorbing into the soil. These trimmings can be used for mulch, then placed back around the tree or in the garden or can be discarded in the trash. Cut branches into smaller pieces for easier disposal.